Next to a wrench, screwdriver and hammer, the cordless drill is probably the most used tool in most people's toolbox. Cordless drills can be used to drill holes in a variety of materials such as wood, ceramic tile, concrete and drywall. In addition, most can be used to easily sink and remove screws. Standard - the standard cordless drill is ideal for sinking screw and drilling through wood and thin metal. Hammer Drill - hammer drills are cordless drills with a kick. Typically a switch on the drill allows the user to turn on and off the hammer effect. The hammer effect vibrated the chuck and drill bit perpendicular to the rotation, driving the bit into the material. Hammer drills are ideal for drilling into concrete and brick. Impact Driver - are a little like a standard drill and a hammer drill with a twist. Impact drivers are used for driving in screws, but unlike standard drills, they use a quick change chuck that only connects with a standard quick change screw bit. The chuck and bit spin to drive in a screw until the force hits a preset threshold, then an internal hammer kicks in and boosts the rotational power up to 3 times that of the motor itself. Voltage - Cordless drills come in a range of voltages from 9.6 to 18. Basically, the higher the voltage, the more power the drill has. Smart Chargers - new chargers can recharge a drill's battery in an hour or less compared to the 3 to 6 hours of conventional chargers. Speed Ranges - most drills have 2 ranges, one low for powering in screws and one high for drilling. Variable Speed - most drills can provide variable speeds within the low and high ranges, while some less expensive models are only 2-speeds. Reversible - most models allow the drill to be reversed to back out of a hole or remove a screw. Adjustable Clutch - allows the user to adjust the maximum power of the drill to prevent stripping of screws or driving a screw in too far into soft wood. Chuck Size - most drills come with 3/8 inch chucks (the largest size bit that will fit in the drill is 3/8 inch diameter), some have ½ inch chucks. Second Handles - many models have screw on handle that allow you to control the drill with both hands. Choose your power. 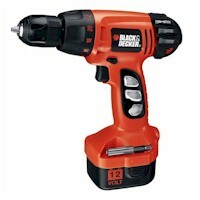 12 Volt drills are as inexpensive as 9.6 Volt models but have better performance. If you are a heavy user, consider a higher voltage model. Choose a model with a smart charger, variable speed trigger and that is reversible. If possible hold the models in you hand to get a sense for weight, balance and comfort.